This is the lowerator used in quartering section. 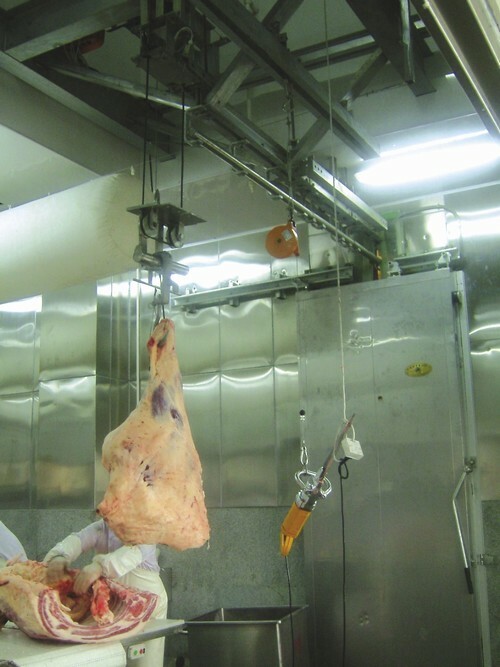 This lowerator is a hoist, modified for meat industry usage. We offer rail part and hook positioning device with it, and will make sure the safety during its operation. We can also provide profile shape lowerator with conveying finger, and will automatically lowerate quartered meat onto deboning and cutting table. ZBHT Slaughtering Machinery Co.,Ltd. manufacturing high-quality quartering lowerator and supply OEM, ODM service according to your personal requirement. Our quartering lowerator and other Deboning And Cutting Room Equipment is not only good in quality but also competitive in price, welcome to inquiry us about the details of quartering lowerator or other slaughtering machine products and accessory equipment.